Food Lion Weekly Ad February 6 - February 12, 2019. Savings You'll Love! 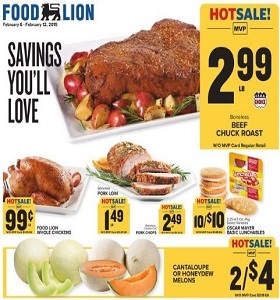 Food Lion Weekly Ad February 6 – February 12, 2019. Savings You’ll Love! -2/$7 Halo Top Ice Cream; 2/$5 Ore-Ida Frozen Potatoes. To see the weekly circular for your favorite Food Lion store, search by ZIP Code or city, state.